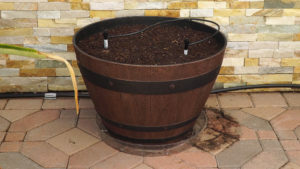 In today’s blog post we will learn how to set up a container garden easily. You can easily setup your container garden complete with pots, saucers and drip irrigation lines. We will learn how to easily set up your container vegetable garden and plant some vegetables in your pots. We will be using resin based wine barrels and using them as containers. Resin is very resistant to the elements and will last for many years. Its also safe to grow fruits and vegetables in. 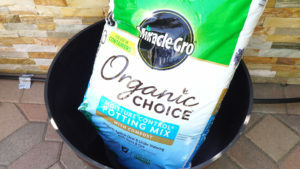 For the soil mix you can use a bagged potting mix or make your own potting mix using peat moss/coco coir, perlite/vermiculite and compost/worm castings. 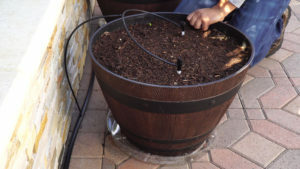 For setting up the drip irrigation line we are using half inch drip tube as the main line and quarter inch tubing as the emitter line. We are using the fan bubble emitter. This provides great coverage while being inexpensive. 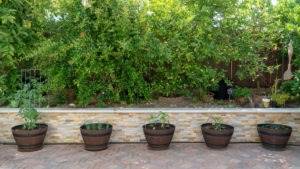 A container garden will expand your growing area and will give you lots of space for you to grow your fruits, vegetables and herbs.